This is our hoophouse today. We’ve pulled our early tomatoes and squash. We’ve got three beds of cowpeas, a seed crop of Carolina Crowder for Southern Exposure Seed Exchange. All being well, they’ll appear in next year’s catalog. Pea and bean seed crops do very well in the hoophouse in summer – the pods don’t get moldy as they can do outdoors, and the crop matures faster. The empty-looking bed to the left of the crop in the foreground is newly sown in buckwheat, hopefully ready to be cleared by September 6 or so, to make way for early spinach and other crops. 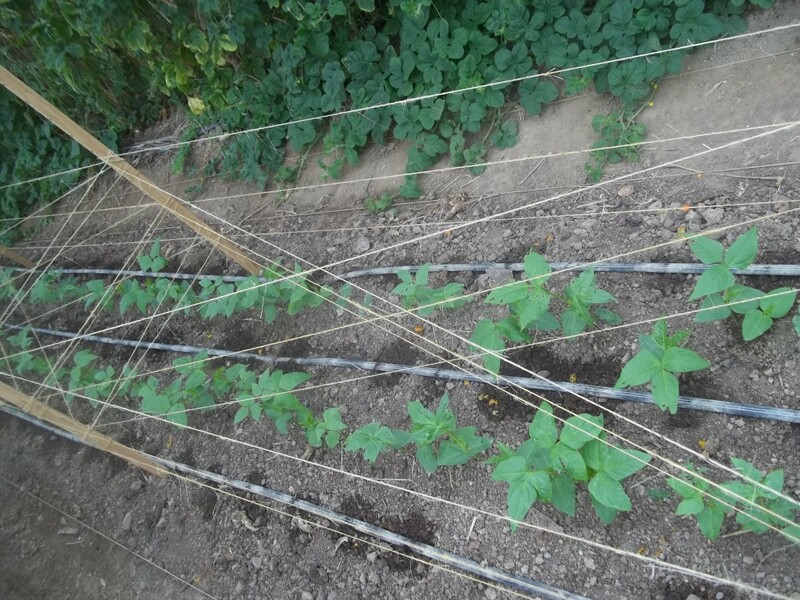 Here’s a photo of our invention, “cat’s cradle” string-weaving, which supports these tall viney plants and keeps them within the bounds of the 4ft wide bed. “Cat’s cradle” string-weaving for a bed of cowpeas. We also still have a bed of West Indian gherkins, one of edamame for seed and a half-bed of peppers. And while we are having a quieter time in there (as far as planting and harvesting), we are launching into planning our fall, winter and spring harvesting crops. After several years of using the hoophouse year-round, we have settled into a happy routine. We plan September-March harvesting crops in early-mid August and March-September crops in February. The September-March crop plan is by the far the more complicated, involving many different crops and several successions of many of those. And each one usually only occupies part of a bed. The late spring and summer crops, on the other hand, are mostly a single row of something per bed. Make a blank map (currently we use an Excel spreadsheet, but squared paper worked well for many years). Update the map by writing in the previous crops at the top of each bed, and the dates it will be available. If using a spreadsheet, merge the rest of the cells in that bed, to give a big open space to write in. Write in the main crop type if known, bold and vertical, with start and finish dates. Print a map, make copies for the planning meeting when the details will be decided. Change the year dates. Replace this year (2015) with next year (2016). Then replace last year with this. Check the Notes column and add relevant info, or make changes as directed. Set the print area, fit all columns on 1 page, landscape, Repeat column headings on all sheets. 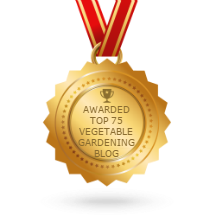 Baby lettuce mix in the hoophouse – what we’re planning for! List the crops to be grown. Spinach, head lettuce, baby lettuce mix, baby brassica salad mix, Chinese cabbage, pak choy, Tokyo bekana, maruba santoh, tatsoi, Yukina savoy, radishes, scallions, turnips, Russian kales, senposai, bull’s blood beet greens, mizuna and several similar mustards, maybe arugula (maybe not), chard, bare-root transplants to go outdoors in spring, maybe beets, snap peas at the beginning of February. Several crops have 2-6 succession plantings. 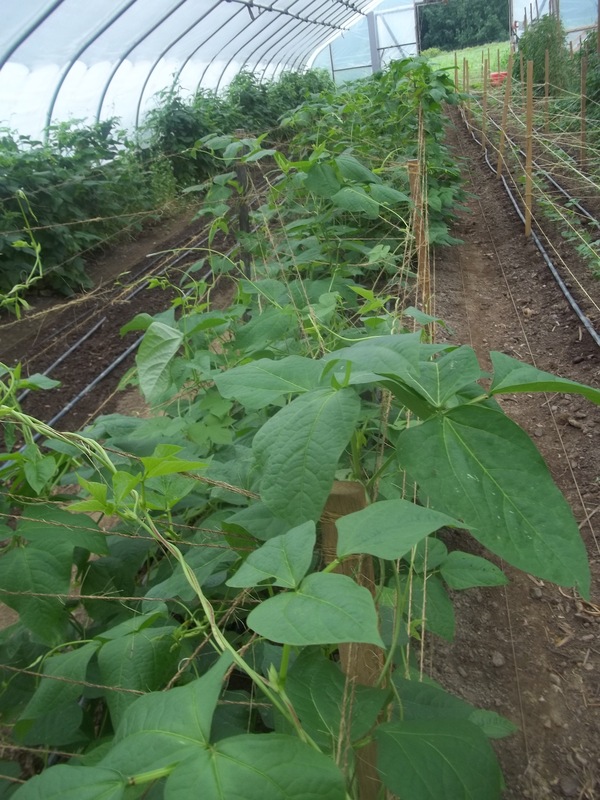 Decide which main crops could go in each bed, considering crop rotations, Nematode Plan, edge beds being narrow and colder, dates of availability, climate change, need for rowcover. Mark the main crops on the map, including how much space they need. Mark the available space left in the bed. Make a list of questions to resolve: quantities, succession crop date tweaks, variety changes, what to do if nematodes are found elsewhere. Make decisions as you go along, and write them down clearly. Figure out the Early September bed and the Nematode bed first, then the others. Work down the schedule and find a home for each crop in a space available timewise and suitable rotation-wise. Write the location on the schedule and the crop on the map, along with how much space it needs. Watch out for changes between growing something in a 2ft edge bed or a 4ft middle bed. Twice as many rows in a middle bed, twice as much length in an edge bed. If changes are needed be sure to follow through and make those changes both on the map and on the schedule. Make the changes on the computer files. Can use Search and Replace, if done carefully. Two people should proofread for sense and for compatibility with the map. Make any needed corrections. Print the final versions. Take copies to hoophouse, field manual, greenhouse, hoophouse file. Original goes in the Garden Notebook file. 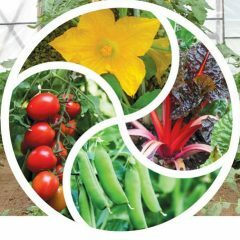 I’ll be giving presentations on The Hoophouse in Fall and Winter, and The Hoophouse in Spring and Summer at the Mother Earth News Fair in Pennsylvania September 18-20. And if you want to enter a draw to win a copy of my book, Sustainable Market Farming, read the review by Deborah Niemann on The Thrifty Homesteader and enter the draw. Just a few days left. Deborah has written several books herself, including EcoThrifty, Homegrown and Handmade, and Raising Goats Naturally. Read about them on her website.